Fujouri has grown on me so much since I first heard it! I didn’t like it while watching the OVA episodes that had it as the ending, I thought it was weird and didn’t really fit for an anime ending. Since then, however, while listening to the full version, I’ve fallen in love with it. 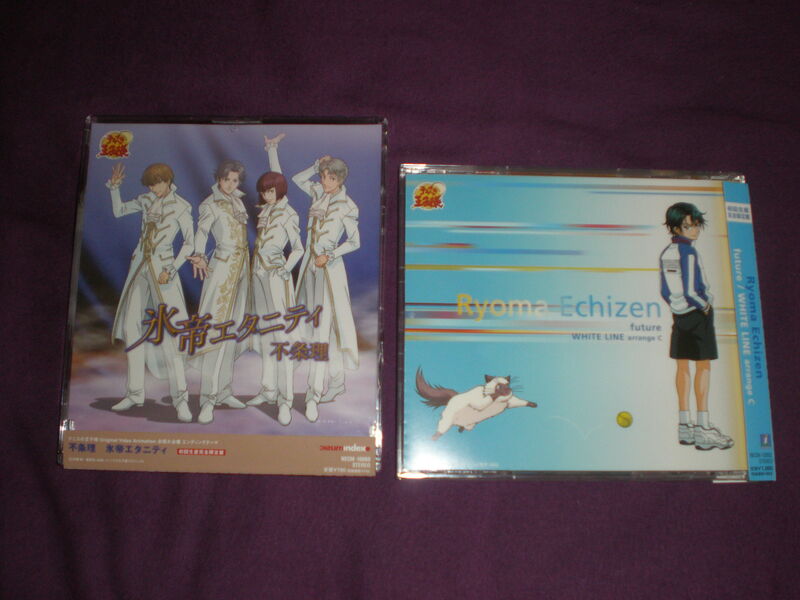 xD It’s also the last seiyuu anime theme song I needed to buy in order to complete my collection. In future / WHITE LINE, the title track, future, is Ryouma’s cover of the very first opening, originally by HIRO-X. I don’t like the original song at all, but I really love Ryouma’s version. I think he sounds kinda like a girl at some parts. xDD Well, he’s voiced by a girl, so I guess it makes sense. WHITE LINE is basically just a solo version of Aozu’s original, which was used as the fourth ending to the TV anime. 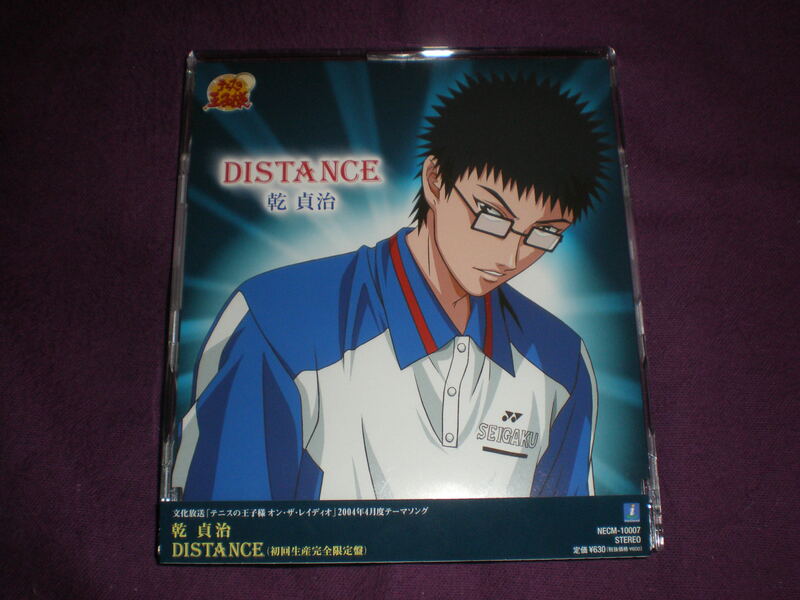 I’m not even kidding, I bought this solely because Inui’s eyes were shown on the cover. Never ever listened to the song or anything, and I’m not a huge Inui fan. Seriously, this guy needs some contacts. He looks much better when you can actually see his eyes. 3 Guava Trio…I’m still wtf-ing over this one. No idea what’s up with the name. No idea what’s up with the uber random members of the group. 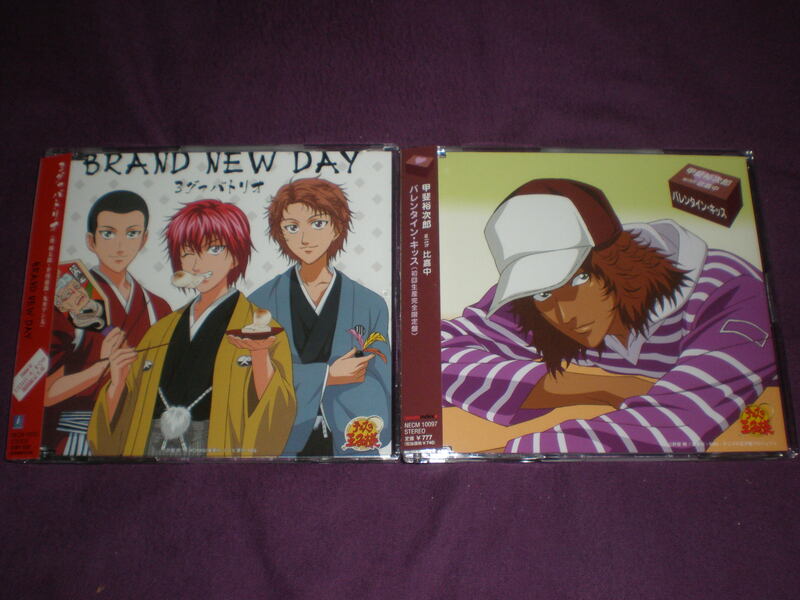 (Jirou from Hyoutei, Aoi from Rokkaku, Marui from Rikkai) Never listened to the song either, I think I might have just bought this because of Jirou? And last but not least, the Buono! stuff! 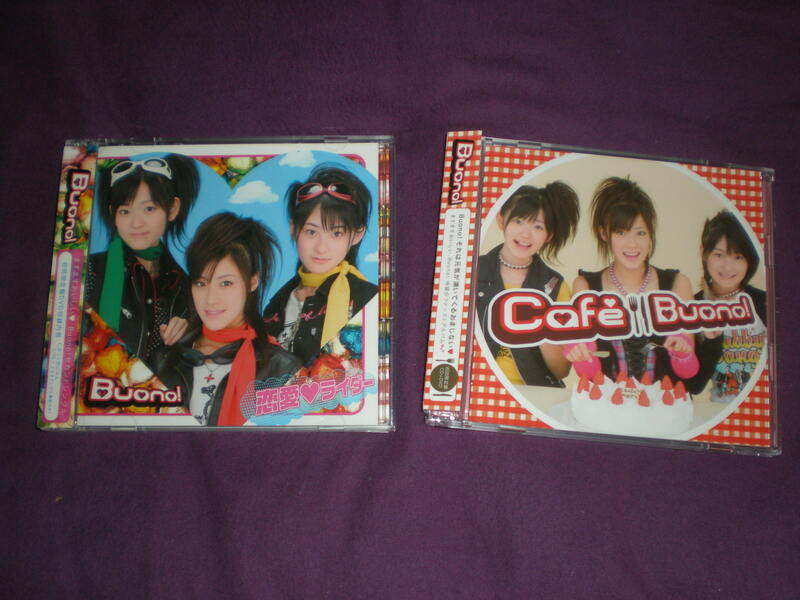 Without a doubt, the #1 item I was looking forward to in this batch of CDs was Cafe Buono!. Cafe Buono! is one of the very few albums that I can say I like every single song on it. It’s a great album and I’m probably going to write a full post on this later. I’m also planning on romanizing and color-coding all the lyrics later today- usually I can’t do color-codes but it’s already color-coded in the booklet! 8D Now why can’t they do that for all the other units?? After I romanize the lyrics to Cafe Buono, I’ll probably scan all of these CDs- it won’t take that long cause the PoT CDs are so BORINg and SIMPLE. xDDDD They don’t even have a booklet, it’s just one page with the cover art on the front and the lyrics on the back. 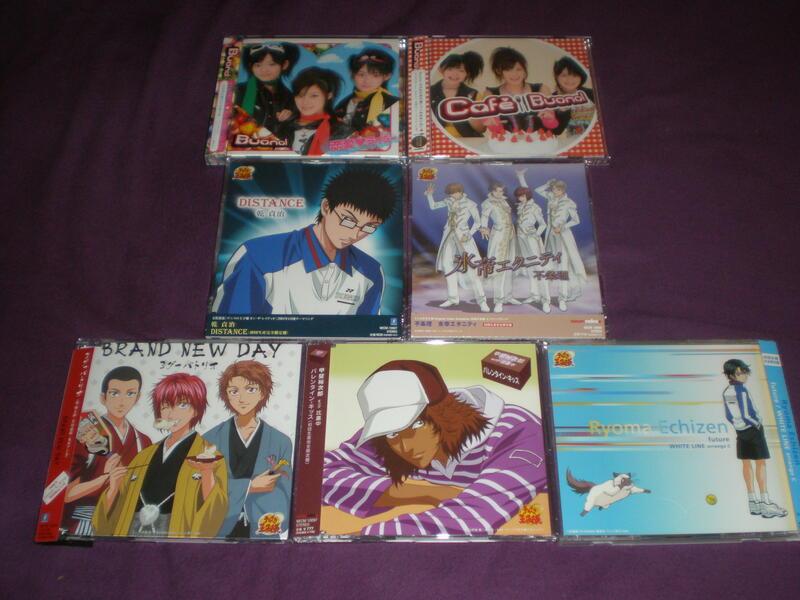 This entry was posted on Sunday, March 16th, 2008 at 12:13 pm and is filed under 3 Guava Trio, Akutagawa Jirou, anime, Aoi Kentarou, Atobe Keigo, BRAND NEW DAY, Buono, Cafe Buono, DISTANCE, Echizen Ryouma, Fujouri, future, Hello! Project, Hello! Project Kids, Higa, Hiyoshi Wakashi, Hyoutei, Hyoutei Eternity, Inui Sadaharu, j-pop, Kai Yuujirou, Marui Bunta, Mukahi Gakuto, Natsuyaki Miyabi, Ootori Choutarou, Prince of Tennis, Renai Rider, Rikkai, Rokkaku, Seigaku, Suzuki Airi, Tsugunaga Momoko, Valentine Kiss, WHITE LINE, Yesasia. You can follow any responses to this entry through the RSS 2.0 feed. You can leave a response, or trackback from your own site. The thing with Inui’s eyes…OMK THEY ARE HEAVENLY! And two: His eyes are shown in the anime 4 times that I know of and once in a movie. And I loove getting stuff from YesAsia! I have a huge stash of their stuff in the corner of my room.